Thursday July 17th 1924 I wrote to Lydia before Hattie & I went to Steve Coldrens funeral at Presbyterian church. I was sewing in PM on velvets for the store. Hattie having curtains hung. Friday July 18th 1924 We did some work in the garret in AM. I sewed in the afternoon. Cora at the store. We spent the evening at Otts. Rob bought a Dodge car for himself today. Saturday July 19th 1924 Hattie and I put some things to rights in the upper floor of the garage. Then we all three went down town. I finished the Velvets. The Byingtons to Brooklyn. Letter from Nellie. 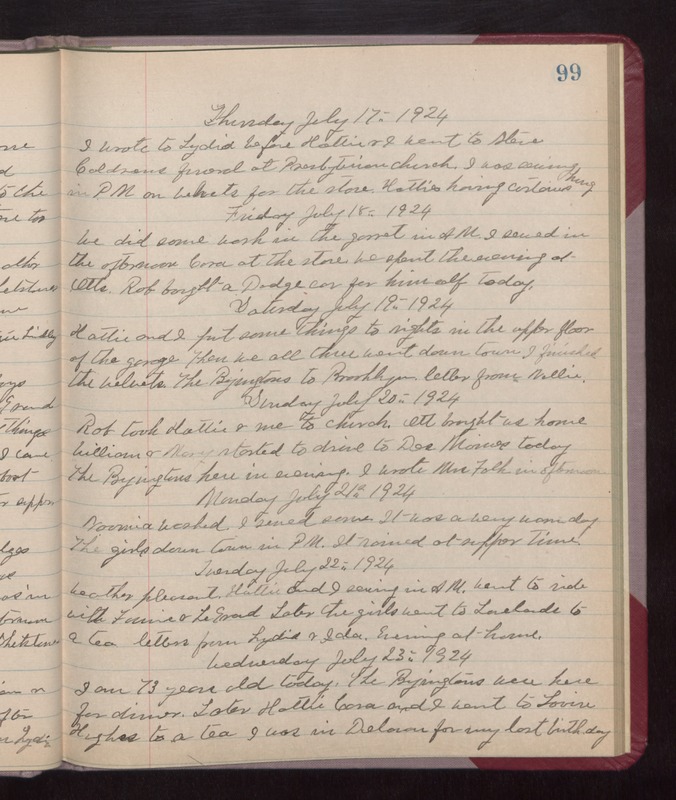 Sunday July 20th 1924 Rob took Hattie & me to church. Ott brought us home. William & Mary started to drive to Des Moines today. The Byingtons here in evening. I wrote Mrs Falk in afternoon. Monday July 21st 1924 Normia washed. I sewed some. It was a very warm day. The girls down town in PM. It rained at supper time. Tuesday July 22nd 1924 weather pleasant. Hattie and I sewing in AM. Went to ride with Fannie & LeGrand. Later the girls went to Lovelands to a tea. Letters from Lydia & Ida. Evening at home. Wednesday July 23rd 1924 I am 73 years old today. The Byingtons were here for dinner. Later Hattie, Cora and I went to Louise Hughes to a tea. I was in Delavan for my last birthday.